We have spent all day at our favorite beach, Ko’ Olina. Eaten more Leonard’s malasadas – this time filled with warm chocolate (Liza, you would pass out!). Swam with a three finned sea turtle. Hit the mall. Sent Kevin and the girls on a dusk beach walk where they watched a fisherman catch a small hammerhead shark right down from our house. Resolved not to go back in the water. Eaten Yummy Korean BBQ. Finished my first beach novel. Had another giant shave ice with ice cream in the bottom. Got sun burnt. Taught Leina how to catch a wave. Sat on the beach under the full moon watching the crabs scuttle across the sand by flashlight. Laughed until it hurt watching my dad try to catch one. Watched Leina crab hunt by flashlight and get one. Played hana fuda with my grandpa under a pandana tree. This entry was posted in Hawaii on August 5, 2009 by Chrissie. I have been here 24 hours. I have been to the beach four times. Watched the sun rise over the ocean. Easten six manapua. Porked out on Leonard’s malasadas filled with haupia and lilikoa. Comforted both my girls who were stung by man-o-wars. Meet seventeen distant relatives I never knew existed. Caught a crab. Ate shave ice. Hugged my grandfather. Played a hand of hanafuda. Watched my kids run laughing through the surf. Sat on the beach and read my book. Spotted two turtles swiming in the ocean. If I left tomorrow, I’d consider this trip the success. And I still have 18 days left. What else is there to do? Don’t worry, I’m sure I’ll be able to dig something up…. 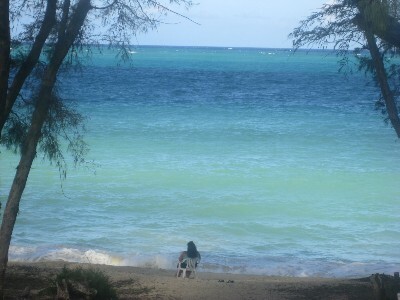 This entry was posted in Hawaii on August 2, 2009 by Chrissie. Aside from reading, I also got some good time with my Hawaiian family. It took a while for the girls to warm up to the horde of new people but once we got out the playdough, they were right in their element. Even stand-off Leina couldn’t get enough of her. She is pretty cuddly if I don’t say so myself. Doesn’t Auntie Bonnie have the most beautiful backyard? It was the perfect backdrop for our photo session when Kulia wasn’t running around pretending to be a wild pig. Don’t Auntie Bonnie and I look alike? I have fooled her neighbors and even used her driver’s license to get local discounts. Shhhh. Don’t tell anyone! 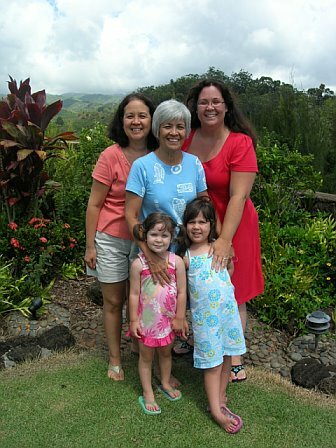 This entry was posted in Hawaii on September 10, 2008 by Chrissie. So, what did I do in Hawaii? Lots. But the thing I miss the most, my most favorite memory? That had to be the hours between 2pm and 4pm when I was able to tuck the kids in bed for a nap, grab a book and a beach chair, and head to the ocean for some uninterrupted reading time. Ah, heavenly. The beach to myself, sitting in the dappled shade, with the white noise of the ocean all around. Perfect for reading. Just perfect! Next time, however, I’m bringing more books! 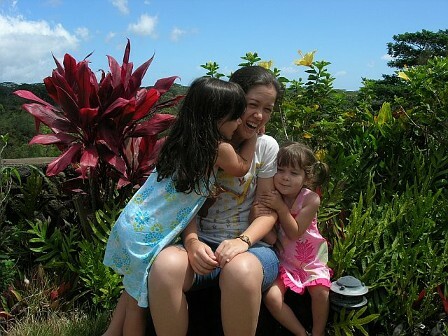 This entry was posted in Hawaii on September 8, 2008 by Chrissie. Where was I…. Nevermind. The surf is calling one last time. I’m going to brave the man-o-wars and soak up a bit more sunshine. When next you see me, I’ll be wearing a raincoat and shoes with socks. 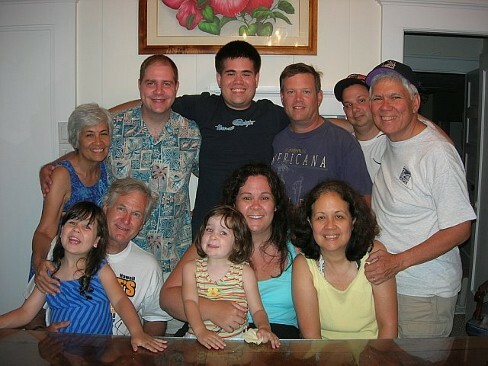 This entry was posted in Hawaii on September 4, 2008 by Chrissie. Ah yes, we are back and it is a beautiful as I remember. Beach, check. Ocean breeze, check. Swaying palm trees, check. Nothing to do but eat and lounge, check, check, check! We had a very easy flight. 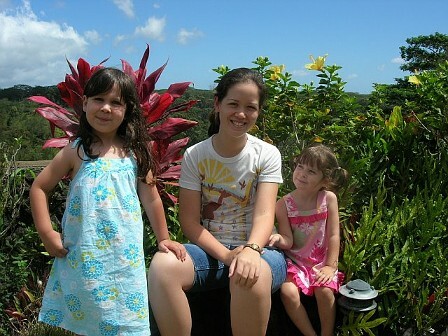 My apprehension about flying alone with the girls was unfounded as they were perfect sisters the entire time. Once we arrived, the cousin immediately ran off playing and laughing and being goofy as only a pack of kids can be. Kulia is finally old enough to join in the fun so the whole pack tromps through the house. Just like last year, Kulia has no fear of the ocean. She just walks right in and gets clobbered. Totaled. Smashed by the waves, covered in sand, but still smiling. Man, I love that girl. Kevin arrives today and then the gang will be all here. I can hardly wait! This entry was posted in Hawaii, Movies on August 26, 2008 by Chrissie.